Elliot Green, Partuition, 2016, oil on linen, 18 x 12 inches. 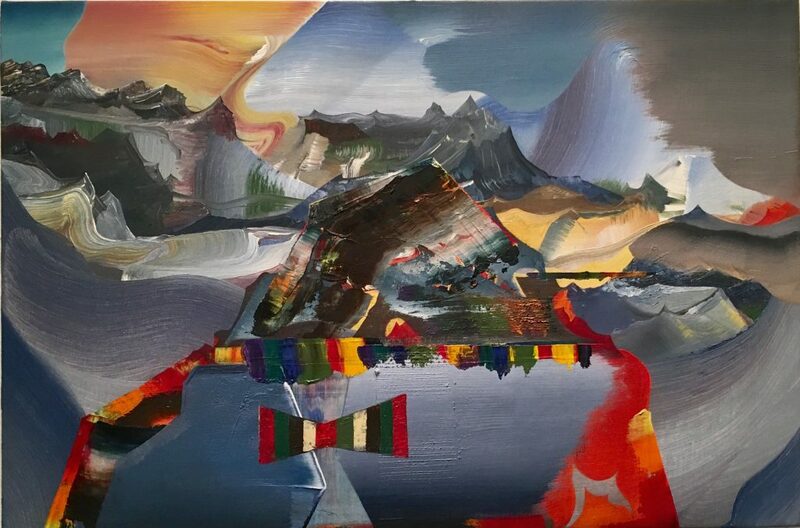 Contributed by Luisa Caldwell and Matt Freedman / Back in December, the uncanny pushed its way into the room of exquisite landscape paintings by David Brody and Elliot Green. Uncanny, as in familiar but incongruous, has become attached to the persuasively surreal in contemporary practice; strange figurations usually, big babies, small grownups, appendages attached to architecture. It is the name we give to challenges to our notions of the body’s integrity, and through that to our unease about our own coherence and mortality. 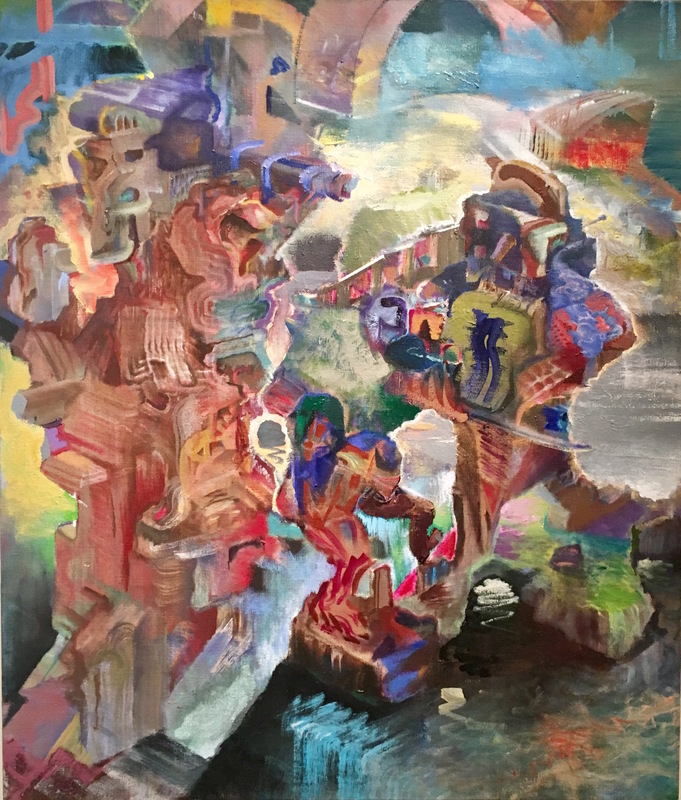 David Brody, Lucid Stench, 2016 , oil on linen, 60 x 50 inches. What Brody and Green have done in their collaboration/non-collaboration is a feat of remarkable alchemy; they have removed the uncanny from the body, from the images they depict even, and set it up as a condition of the space around their work. It is atmosphere of the room itself. Their system is simple enough. We believe, during the first moments of our time in the gallery, that we are in a show that sprung from a single brain. Scale, palette, subject matter are at first glance consistent throughout the room. Where does one artist stop and the other begin? And then the argument comes to its point. We are led by the beguiling paintings to a kind of embodied revelation of the constructed nature of perception itself. We approach with an emphasis on the familiar and the similar; the horizontal geometry of a pastoral landscape, the grid-work urban jumble of roads and conduits, when suddenly we notice the categorical distinctions in subject and technique between are more than merely formal, they are systemic. There are two very different visions here in close proximity to each other and we must pay attention or we will miss everything. Elliot Green, Schismatics, 2014, oil on linen, 18 x 14 inches. When that suddenly self-evident insight occurs, the exhibition snaps into focus and the world is split in two. There are two worlds in close orbit, carefully depicted, utterly unreconcilable. We start to speculate about the reliability of perception of reality itself. Brody and Green get into our heads and it’s the mechanics of painting that get them there. Brushwork, knife work. Strange juxtapositions. Local color. Atmospherics. The gallery becomes a master class in how to look at paintings and in how much to trust–or mistrust–your senses. Brody and Green use abstraction to interpret landscape and a similar palette of muted tones splashed with fuchsias, oranges, and all-over bright colors. Both span the boundaries of figuration and abstraction equally, with details of color, either noodling or of vast strokes. However, Green’s paintings are classic landscape in the horizontal format with the vista in the distance. There is a visual relation to Cezannes series Mont Sainte-Victoire, of the southern French mountain landscape. Like Cezannes, these mountains are made of angled blues, greys, or hard edged layering, but Green does not seem to paint from life as Cezanne did. His are virtual, with large swaths of paint weaving in and out of the scape. One painting is only wide strokes, pure abstraction. A series of six, smaller 16 x 11-inch paintings, from a distance seem almost photographic which is a strange reading because there is nothing “realistic” about them. Interesting is the addition here and there of some fine, smaller geometric shapes. They seem like symbols or icons, stamps of indecipherable meaning, a definition incongruent to the traditional. The paint quality is slippery and opaque, with methodical, decisive boundaries defining the image, somehow never completely leaving the landscape idea. David Brody, Untitled, 2016, oil on linen, 60 x 50 inches. Brody’s paintings, while landscape-ish, depict architecture equally, which then become canyons and cliffs. But it is all fragmented and jumbled and layered. 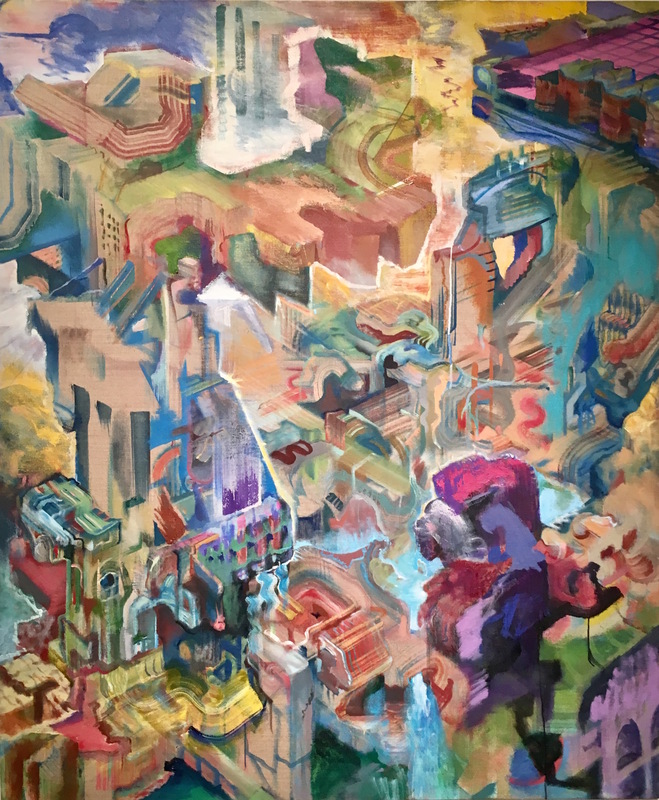 In Brody’s paintings, the historical reference is Neo-classic, evoking Piranesi’s The Prisons (Carceri d’invenzione or ‘Imaginary Prisons’), which is a series of 16 prints that show enormous subterranean vaults with stairs and mighty machines. Brody’s perspective is much closer, and at a 3/4 angle, and like Piranesi has chosen the vertical portrait format for his “landscapes”. These paintings are more obfuscated, and the paint is drier with more of a range from transparent to thick. It is not always clear where something starts and ends, with colorful, yet pensive meandering in splashy oranges and pinks and yellows. And where Piranesi’s work depicted “mighty machinery,” Brody’s look like engine blocks removed from a car, or more odd, Peter Saul-like grotesque heads in an unreadable cartoony style. 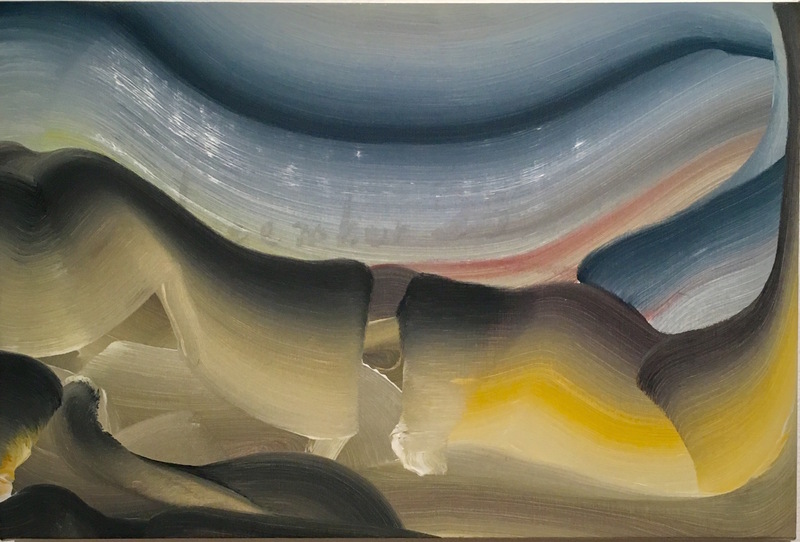 There’s a lot going on in these paintings, lending them more towards abstraction by way of stream of conscience, despite their literal references. If what I see and what I think is not what you see and what you think, how will we even begin to talk to each other? What can we trust? Once those questions are on the table, everything is up for grabs. We can no longer trust that we see the world as it is, merely that we see it as the construct of our particular preferences, fears, predilections, and limitations. We are post-truth. A lot to pile onto a roomful of paintings, but there you are. “Narratives of Enigma: David Brody and Elliot Green,” Studio 10, Bushwick, Brooklyn, NY. November 18th – December 18th, 2016.